Shores, muddy banks, and pools, thriving on recently exposed surfaces; ditches, puddles and ruts in roads and trails, marshes, and wet meadows. A circumpolar species, and some of our plants may represent introductions from the Old World. This species may be truly aquatic, with some floating leaves when growing in shallow water. It may bloom into November. 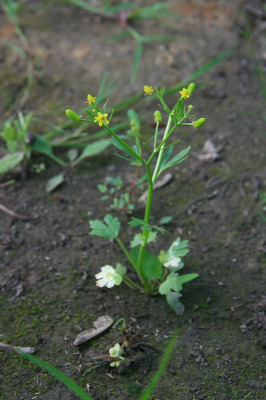 It is usually readily distinguished from R. abortivus by its cylindrical fruiting head, more succulent leaves, slightly paler yellow petals, lobed lower leaves, and moister habitat. MICHIGAN FLORA ONLINE. A. A. Reznicek, E. G. Voss, & B. S. Walters. February 2011. University of Michigan. Web. April 21, 2019. https://michiganflora.net/species.aspx?id=2400.